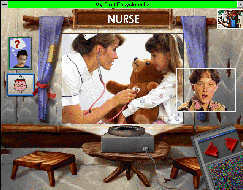 SuperKids Software Review of Knowledge Adventure's My First Encyclopedia -- CD Encyclopedia. Providing reviews of children's educational software for parents, teachers, kids and schools. Our reviewers almost uniformly went through the same reactions to My First Encyclopedia (MFE). Initially, they felt mislead, because this was not the watered-down CD encyclopedia they expected. But once overcoming that reaction, they discovered a really neat, kid-captivating package. MFE is organized around a tree house, stretching from its roots in the earth, to its branches in the stars. Each location along the way has its own "floor," with a doorway leading into an area of learning. The kid-captivating dimension comes from the use of small children in video windows as narrators/teachers. These narrators had a mesmerizing effect on their kid reviewer peers. This attention-grabbing concept gave MFE a high proxy parent value. ("Proxy parent value" is the SuperKids measure for a software package's likelihood of being interesting and useful to a child working independently, over the long term.) In other words, this is a piece of software children can immerse themselves in repeatedly, without mom or dad hovering nearby. Our kids reviewers liked My First Encyclopedia, more so when used on the higher performance machine. In fact, several parents of four and five year olds reported difficulty in getting their kids away from the software! The software is appropriate for both readers and non-readers. Subject matter is broad, ranging from the earth and nature, to the transportation, to space. As a result, you should view this as a package to introduce children to some interesting facets of a lot of areas -- not as a reference encyclopedia. Would our parent reviewers buy this software again? Yes! The high proxy parent value, and broad range of topics covered, make My First Encyclopedia a winner.